The following is a list of Ashburton clockmakers, taken from Devon Clocks and Clockmakers, Clive N. Ponsford, David and Charles, Newton Abbot 1985, p328. Many thanks to F & W. Media International Ltd., http://www.fwcommunity.com/uk, for permission to reproduce the data. I have added to it where I have additional information - I am now also adding watchmakers. There are two Thomas Bidlakes marrying in Ashburton in the 1700s - or one Thomas Bidlake marrying twice. In September 1764 Thomas Bidlake marries Douglas Saunders. Thomas and Douglas (various spellings) have a child Ann baptized in March 1765, Thomas Hamlyn Bidlake baptized in October 1770, and Joseph baptized in September 1772. In November 1775 Thomas Bidlake marries Ann Hurst. Thomas and Ann have a child John baptized in 1777, Thomas baptized in March 1778 and Ann baptized in April 1781. 26th May 1787 saw Emanuel Hart apprenticed to Thomas Bidlake, clockmaker, in the borough of Plymouth. In January 1821 a Thomas Bidlake was buried in Ashburton, aged 83, giving him a birthdate of circa 1737/38. This would fit a baptism of a Thomas Badlake, father John, in Ashburton in December 1737. Index to Ashburton burials 1813-1837, Devon Family History Society 1997. When John Burston married Ellen Deborah Whitmarsh at York Street Chapel, Plymouth, in 1876, he was described as being 'of Ashburton'. The 1880s section of the Virtual museum has a receipt from John Burston, watch and clock maker, and jeweller. Mr Burston also sold 'Spectacles for all sights'. In the 1881 census John Burston is shown in East Street, but by 1891 was in St Lawrence Lane. Later he moved to Newton Abbot, having been at Ashburton for 18 years. Boarding with John at the time of the 1881 census is 17 year old William G Argent, an apprentice born in Matfield, Kent. By 1911 William Grove Argent is a watchmaker in Kent, living there with his Ashburton born wife, Theresa Nankivell Argent. 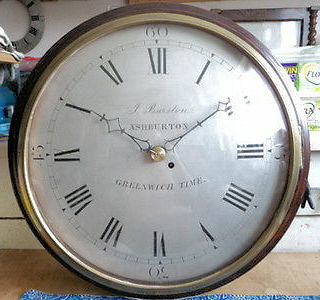 Above: A John Burston clock with an 18" dial. The large size, and the fact that it says 'Greenwich time' suggests to me that it was designed for commercial premises, possibly Burston's own. Before the coming of the railways different parts of the country had different time zones. H W Chard was Harold Walter Chard, a 14 year old jeweller's assistant on the 1911 census. At the time he was living in Honiton, where he was born. He was on the electoral register for Honiton in 1922, but by 1923 was in Ashburton. He was still in Ashburton in 1929, but by 1931 had returned to Honiton. Above: Clockface by J Conneybear, Ashburton. Many thanks to Steve Wood of Fusee World, http://www.fuseeworld.com/ for this image. 1844 James Conneybear, West Street, is listed as a watch and clockmaker in Pigot's Directory. Pigot's Directory of Berks, Bucks etc., part 1, p152. In 1850 Jas. Coneybear is listed as a watchmaker in White's Directory, still in West Street. The 1861 census shows a father and son, both named James Conneybear, and both clock and watchmakers. 61 year old widower James, in addition to his main profession, is a gunsmith and plumber employing one man. James jun., 34, is unmarried. 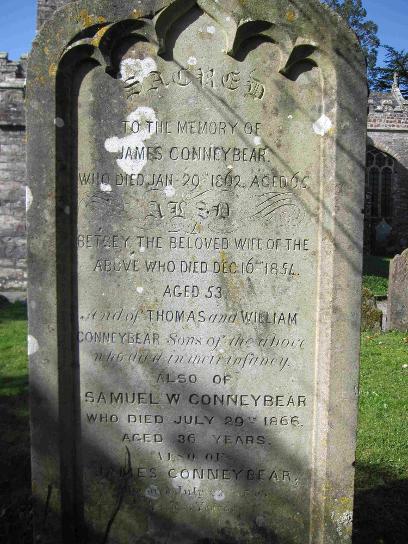 1876 A document held in the North Devon Record Office concerns the transfer of a mortgage in which Mary Wolton Conneybear, executor of James Conneybear, watchmaker of Ashburton deceased, is named. The mortgage, which concerns property in Ashburton, Chagford, Holne, Lydford and Dawlish, also names Susan Hannaford Conneybear and Eliza Conneybear, spinsters. It seems likely that this is to do with the James Conneybear who died aged 54 in 1876, and although there is some discrepancy with the age, he may well be the James who was living with his father on the 1861 census. Mary Wolton* Conneybear may be the Mary W. Conneybear who is living in West Street at the time of the 1891 census. Aged 50, she is single and living on her own means. *Other records connected with the Conneybear family suggest this might be Wotton, Wooton or Wootton. In 1790 a suit was filed in Chancery by Samuel Coneybear, described as a clockmaker of Ashburton 'and one of the second poor of Buckland in the Moor'. The suit alleged that profit from an estate had been withheld from Samuel and others entitled to it. 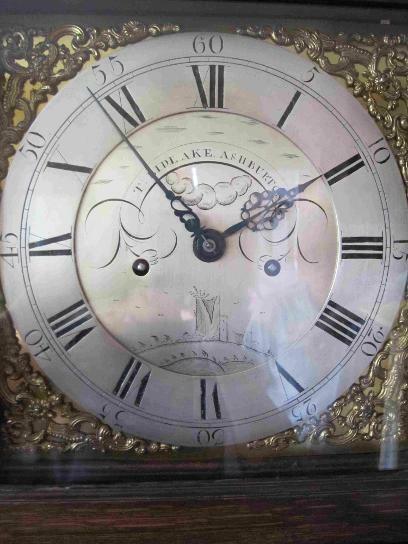 A clock from the Congregational Chapel, now in Ashburton Museum, was made by Martin Dunsford. Information from the museum states that it was presented to the Chapel in 1791 by Sir Robert Palk. For more on this see the Churches and Memorials page. The court for relief of insolvent debtors, at the court house, Exeter, March 1827. London Gazette, Jan-June 1827, p365. Tho. Hamlyn jun., clock and watch-maker, appears in the Universal British Directory of Trade, Commerce and Manufacture, Vol 2, late 1700s. Above: A wall clock by Charles Harding, Ashburton. A Charles Harding was baptised on 3rd April 1768, at Plymouth St Andrew, the son of John and Mary Harding. It is possible, but not certain, that this is the Charles who is later 'of the parish' of Ashburton. Charles Harding, clock and watch-maker, Ashburton, appears in the Universal British Directory of Trade, Commerce and Manufacture, Vol 2, late 1700s. In February 1792 Charles Harding and Mary Ann Eales married in Ashburton. Both were of the parish, and both signed the register. A Charles Winchelsay Harding was baptised in Ashburton in May 1792, the son of Charles Harding and his wife Mary. They had other children baptised in the town: Mary, 1796; Elizabeth, 1798; Ann Eales 1801; John, 1803; Thirsa, 1806 and William Walts, 1808. In 1841 both Charles Snr. and Mary are approximately 70 years old - and were therefore born circa 1771. It is difficult to read Charles' occupation, but it looks like 'watch m'. Charles Harding, watchmaker of Ashburton, died on December 14th 1844. In 1847 there was an investigation in Sidmouth into the circumstances of a fire, where a Mr Denby lost property and goods. Charles Harding, watchmaker, proved that Mr Denby had owned a gold watch. In the 1851 census Charles W Harding, born in Ashburton circa 1793, is married and living in Sidmouth. He is a watchmaker and clock worker master. 80 year Mary Ann Harding is staying with her son-in-law in Wolborough, Newton Abbot in 1851. He is James Thomas, a watchmaker - Mary Ann puts down her occupation as 'formerly a watchmaker'. Mary Ann died in Ashburton in 1858, aged 87. She was described as the relict of the late Charles Harding, watchmaker. A John Harding was baptised in 1803, the son of Charles and Mary Harding. It seems highly likely that this is the John Harding below. John Harding married Elizabeth Husson in 1827. When his son John (ii) was baptised in 1839, John is described as a watchmaker. In the 1841 census John and his wife Elizabeth, living in East Street, have 6 children, of whom 2 year old John is the youngest. John Snr is a watchmaker. 1844 John Harding, East Street, is listed as a watch and clockmaker in Pigot's Directory. In 1850 John Harding is listed as a watchmaker in White's Directory, still in East Street. By 1851 John is a 46 year old widower. He is described as a jeweller. A John Harding*, watchmaker, was fishing in the River Dart when he spotted a boy's cap floating in the river. This later turned out to belong to William Butchers, who had drowned. John Harding, watchmaker, is listed in the Index to Death Duties for the year 1860. Edward Husson is the executor. 1868 When Thirza Harding died in Islington, London, in January, aged 31, she was described as the youngest daughter of the late J. Harding, of Ashburton, watchmaker. John Harding, a watchmaker, married Anne Giles in May 1860. His father is John Harding, watchmaker. John Harding Jnr. is a 21 year old watchmaker later in 1861, living with his wife and son John C in East Street. His sister Thirza is with him on census night. John Charles Harding was baptised in November 1863, with his father being described as a silversmith. This is probably the J C Harding from Ashburton who married Sally Down in the US. See the Down and Beer family, under individual families. * A second John. There appears to be no death record for John C. In 1881 Charles Harding, aged 20 and born in Ashburton, is in the household of his uncle Henry Giles. Both Charles and his uncle are boot makers. The 1920 US census states that John Harding immigrated to the US in 1881. Family members on this and other censuses confirm that this is a John C Harding. John and William Harding, sons of John and Ann, were baptised on the same day in April 1864. John Snr. was a silversmith. Annie died, aged 30, in 1868. A notice in April 1869 said that all persons owing or owed by the estate of John Harding, jeweller, 'late of Ashburton' were to put in their claims by April 30th to Messrs Giles and Sons, boot and shoemakers of Ashburton. In 1877 Adrian Hays acquired a certificate of naturalization to become a British subject. The certificate says he was a subject of Baden in the empire of Germany; was 29 years old, married but with no living children. A jeweller, he was living in Ashburton. Naturalization certificates and declarations, piece 007, no. 2227. The 1901 census shows Adrian Hays to be a naturalized British subject, born in Nussbach, Germany. He is a jeweller, ('gold' is written alongside), living in North Street. Above: Adrian Hays with Joseph Fitze Baker (J F Baker is surely the one on the right - see the Baker family under Individual families). 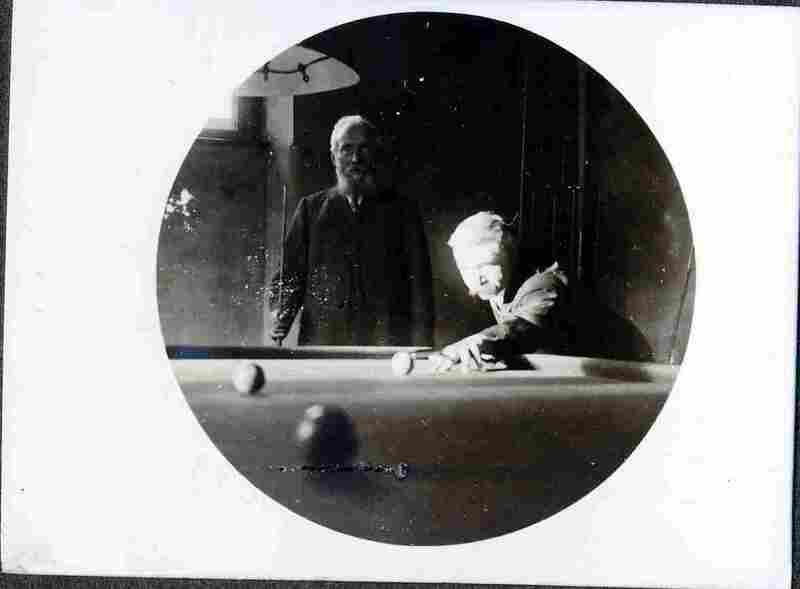 This photograph may have been taken at Hillcrest, the Baker family home - when the house was auctioned in 1946, it was advertised as having a separate annexe with billiard room. Many thanks to Lerida Arnold for the above photograph and additional information. In the census of 1911 he describes himself as a jeweller. Aged 64, he is living with his wife and two daughters at 24, North Street. 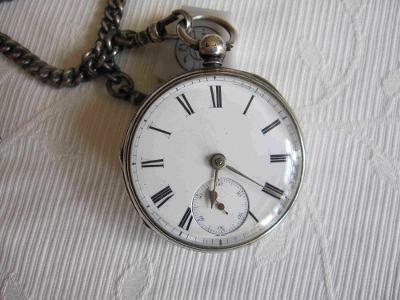 Left: A silver pocket watch by A Hays, hallmarked Chester 1885. When Widecombe church clock was out of order, it was recommended that Mr Osborne, of Ashburton, should undertake any necessary repairs and maintain the clock for six months. The 1891 census shows 43 year old William Osborn living at 'Jewellers shop' with his wife Jane. Originally from Earlscote in Warwickshire, William is a watchmaker and jeweller. 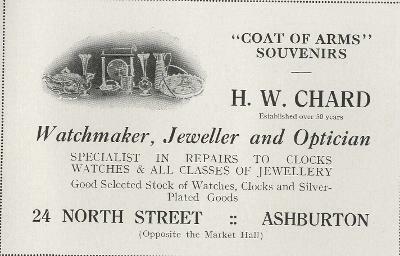 William George Osborn is shown as a watchmaker in West Street in Kelly's Directory for 1902. The funeral of Wm Geo Osborn took place in April 1920. A 'highly respected tradesman' who lived in East Street, he had been in poor health and had lost his eyesight. The 1841 census shows John Perryman, aged circa 50, as a clockmaker in Cad Lane. The only other Perryman in the household is 13 year old Mary. 1844 John Perryman, Cad Street, is listed as a watch and clockmaker in Pigot's Directory of Berks, Bucks etc., part 1, p152. In 1850 John Perryman is listed as a watchmaker in White's Directory, living in Back Lane. The 1861 census shows 70 year old widower John Perryman living in North Street - this would give a birth year of circa 1791. He is a watchmaker. A John Perryman aged 83 was buried in Ashburton on October 22nd, 1872 - giving a birth year of circa 1789. William does not appear in Devon Clocks and Clockmakers. The Devon Family History Society index of burials in Ashburton shows a William Perryman buried in October 1818, aged 64 (he was therefore born circa 1754). The FamilySearch website shows a William and Mary Perriman - with an 'i' instead of a 'y' in their name - as the parents of a John Perriman baptised 30 June 1790 in Ashburton. 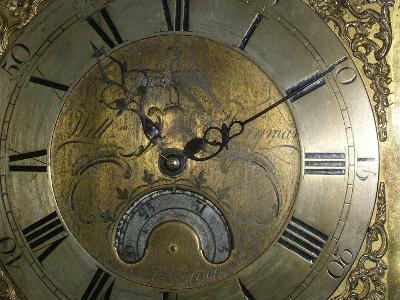 Above and right: Longcase clock, the face engraved with the name Willm Perryman. With many thanks to Mike Sellers for these photos. It seems likely that William was the clockmaker whose work is pictured here, and that Mary was his wife. It also seems likely that their son John (Perriman) baptised in 1790 is the John Perryman clockmaker shown in the previous entry. The 1871 census of Ashburton shows Leonard Schwer, a watchmaker and jeweller, in West Street. 32 years old, he was born in Baden, Germany. The writer also connects Peter Waycott to Holne, Staverton and Totnes, and his son Robert to Paignton and Torquay. In October 1762 Peter the son of Peter Wycott was baptized at Staverton. March 1795 saw the marriage of Peter Waycot, bachelor and sojourner in Ashburton, to Elizabeth Bond. He signed the register with a cross. In 1801 Peter Waycot 'the elder' was buried at Ashburton. He was said to be 28 when he served consecutive sentences of hard labour for several offences. By 1880 Mr Baker was in the Ashburton area, and appeared at the Petty Sessional Court, again charged with obtaining money by false pretences. He had told Mr Wills of Lounston Farm, Ilsington, that he was a son of the late Mr Coneybear, an Ashburton watchmaker, and had taken on the businesses of Giles (late Harding) and Mr Hays. Mr Wills gave him a clock to repair, and said he would pay him when he came into Ashburton. However, when Mr Wills was away Baker asked the housekeeper for 3s 6d, which she paid. Adrian Hays said that he did not know the prisoner. During the course of the trial it was revealed that Baker had married five weeks previously. When his wife visited him at Ashburton police station she told the sergeant that she had not known him before their marriage, and she was unaware of his previous convictions. She had thought he was a respectable jeweller. Baker seems to have been remanded in Exeter Prison, but in April was found not guilty of fraud, and was acquitted and discharged. Aged 38, he was described as a jeweller. Later the same year, in August 1880, Frederick was charged with assaulting and attempting to strangle his wife, Emma*. 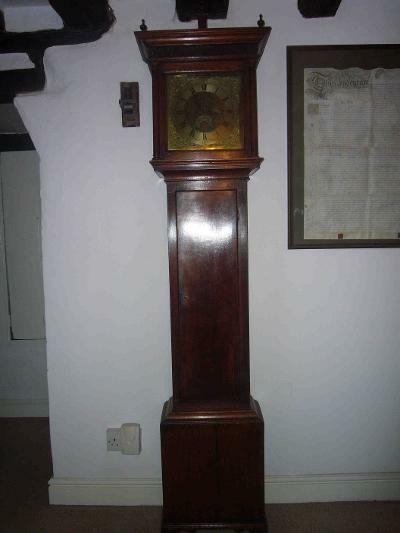 Described as an itinerant clock and watch repairer, he lived with Emma at No. 1 Court, East Street - they had been married seven months at the time. The offence, witnessed by Emma's sister, occurred when Baker had been drinking and the couple argued about moving north. Later the sister coaxed the defendant upstairs, but shortly afterwards she heard something being smashed, and when she investigated had to protect herself from shards of crockery which he threw down at her. After a long discussion the bench declined the prosecution's request for a judicial separation, but fined Frederick 15s for the assault. He 'impudently' flung the money on the table, and he was warned about appearing before the court again.